Yesterday was just like any other Monday/ Wednesday or Friday with Coach and I visiting the Winnipesuakie Wellness Center where I workout 3 times a week for various medical problems. Coach has the distinction of being both a service dog and therapy dog. 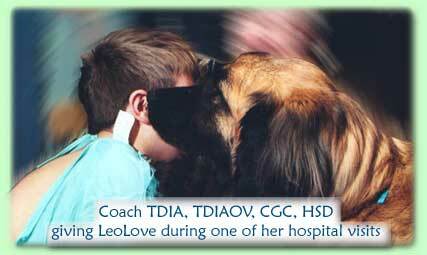 This particular day she was acting as a service dog and taking care of dad until she was called into action as a therapy Leo. The Wellness Center is attended by patients recommended by their doctors. Most of us are on the autumns side of life, but yesterday there was a teenage girl with Down Syndrome, or Up Syndrome as we prefer to call it in NH, accompanied by an aide. We were told that she had reasonable intelligence but didn't speak other than grunts and was there to improve her physical endurance. Coach assumed her usual position at my feet next to a stationary bicycle that I was working out on. The teenage came over and sat down on the floor next to Coach. She petted Coach and Coach put her head on the teenager's lap and kissed her as she normally does when doing therapy work. The young girl then uttered "I love you" to Coach. The whole place came to a sudden stop and silence prevailed. She said it again and tears began to flow. THE POWER OF A LEO IS LIMITLESS.